Fulham's Dan Burn said he had "never headed that many balls since the Conference" after defending 81 Manchester United crosses. Burn, 21, made 22 clearances in the 2-2 draw at Old Trafford on Sunday. The number of crosses set a new Premier League record. The 6ft 7in defender, who played 10 times in the Conference for Darlington in 2011, added: "We knew that was going to happen and I was happy for them to play like that." 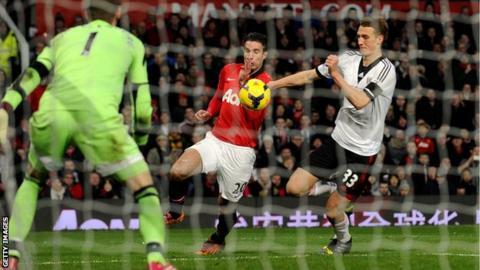 Fulham boss Rene Meulensteen had described United's style as "straightforward". Despite breaking the crosses record that had stood since 2006, only 18 found a player in red. Darren Bent's injury-time header secured Fulham's first point in four matches but United manager David Moyes defended his side's tactics, stating playing with width was "in United's genes". "I'm six foot seven so it helps when dealing with those sort of balls," added Burn. "Manchester United still have amazing players - on another day they could have scored more often but we defended really well." Later on Monday, Fulham published their own interview with Burn in which the defender said: "I didn't mean that quote to sound as disrespectful as it's been reported. "There were a lot of crosses, statistically more than any game since stats started, so I just joked that I hadn't headed as many balls since the Conference." Fulham sit bottom of the Premier League and host Liverpool on Wednesday, while United travel to Arsenal.